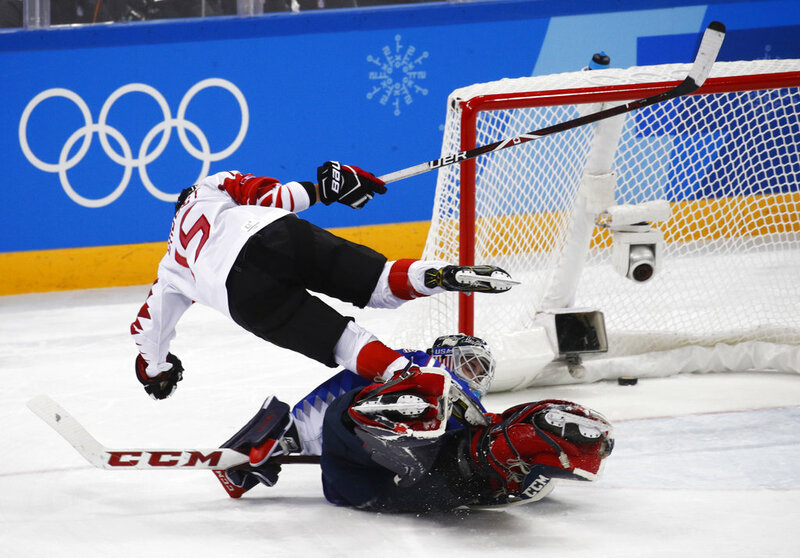 Melodie Daoust (15), of Canada, scores against Goalie Maddie Rooney (35), of the United States, during the shootout in women's gold medal hockey game at the 2018 Winter Olympics in Gangneung, South Korea, Thursday, Feb. 22, 2018. GANGNEUNG, South Korea — Maddie Rooney couldn’t stop smiling. She was on top of her game, and it didn’t seem to matter that it was a shootout against the powerhouse Canadians. The first shootout in an Olympic women’s final. With a gold medal on the line. Her coach, Robb Stauber, made sure not to say a word to the 20-year-old goaltender. “I know she has ice in her veins,” Stauber said. It sure looked like it. Rooney made 29 saves through overtime, then turned away shots from four Canadians in the six-round shootout, smiling along the way at her jubilant teammates on the bench. The last save came against four-time Olympian Meghan Agosta to clinch a 3-2 victory that ended the Americans’ 20-year gold medal drought . The goalie who took the year off from college at Minnesota-Duluth had outdueled three-time Olympian Shannon Szabados, who was among those who prefer overtime over a shootout to settle such an important game. The United States had to replace not one, two but all three of their goalies after losing gold in 2014 at Sochi. 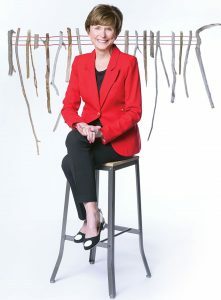 Rooney, who played her senior year of high school in Andover, Minnesota, on the boys’ varsity team, was the goalie in net for each of the three U.S. victories over Canada in pre-Olympic play. She bounced back from a 2-1 loss last week to Canada and then some on Thursday. Rooney said she’s been told it’s important to stay calm under pressure. She is sure she’s been nervous at times. Canada’s Meghan Agosta(2) skates away as the United States players celebrate after winning the women’s gold medal hockey game against Canada at the 2018 Winter Olympics in Gangneung, South Korea, Thursday, Feb. 22, 2018. Her teammates said they had complete confidence in Rooney, who has only been with the national team since the 2017 world championships. Gigi Marvin, the oldest on the roster at 30, has been rooming with Rooney. She called Rooney unbelievable in net, so strong that they had complete trust in her. Stauber, a former goalie, knows exactly what a goaltender that never gets rattled means for a team. He didn’t worry about Rooney even after Haley Irwin and captain Marie-Philip Poulin scored in the second period to give Canada a 2-1 lead. Melodie Daoust (15), of Canada, scores against Goalie Maddie Rooney (35), of the United States, during the shootout in women’s gold medal hockey game at the 2018 Winter Olympics in Gangneung, South Korea, Thursday, Feb. 22, 2018. Monique Lamoureux-Morando scored on a breakaway late in the third period to force overtime. Rooney stopped all seven shots in the 20-minute overtime, which ended with a Canadian power play. In the shootout, Agosta beat her stick-side and Melodie Daoust scored, too. That was it. Rooney stopped Natalie Spooner, Poulin and lastly Brianne Jenner and Agosta taking a second turn as Canada’s final shooters. “Then it all came down to Maddie Rooney, and she had a gold medal-winning performance,” U.S. forward Hilary Knight said.